Step 1 Preheat the oven to 220C/425F degrees. Step 2 Toss the broccoli in the coconut oil. Step 3 Add the garlic and season with the salt and pepper. Step 4 Place on a baking tray and roast for 20 minutes. Step 5 Take the broccoli out of the oven and sprinkle half of the Parmesan cheese over the florets then place back in the oven to bake for a further 5 minutes. Step 6 Place the lemon juice, rind and remaining Parmesan in a bowl. Step 7 Remove the broccoli from the oven and toss in the lemon and Parmesan mixture. Step 8 Eat and enjoy! 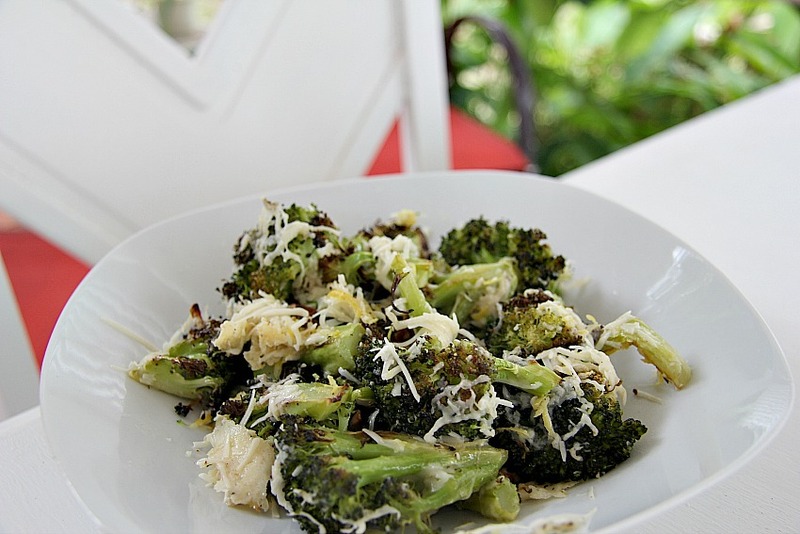 A roasted broccoli dish with garlic and Parmesan cheese that is delicious as a side dish or even just by itself. I enjoy roasting vegetables as it seems to enhance the flavour and beats a plateful of boiled vegetables any day! The flavours of garlic, lemon and Parmesan lift this green vegetable to another taste level. It’s sometimes a way of serving vegetables than can convert the haters. If your loved ones are expressing an aversion to broccoli, slip them a plate of roasted broccoli.